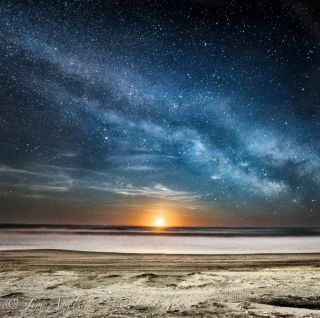 Astrophotographer Jim Abels traveled to Ocean City at the bottom of New Jersey to capture this moonrise and the Milky Way. Image submitted April 25, 2014. A trip to the beach to photograph a meteors led to an unexpected, and amazing, encounter with the moon for one veteran astrophotographer. Night sky photographer Jim Abels was at the beach in Ocean City, New Jersey, last month when a dazzling view of the moon caught him by surprise. Abels used a Nikon D800 camera shooting at 14mm f/2.8 25 seconds at ISO 3200. He submitted the image on April 25. Light pollution is excessive or misdirected artificial, outdoor lighting that limits the visibility of objects in the night sky. It competes with starlight, making it difficult for astronomers to sometimes capture the Milky Way, galaxies and even nebulae.